Article in The State Newspaper about my dad. Chappelle Heath Manning, 80, of Columbia died Sunday. He was born January 22, 1928, the eldest son of Katharine Heath Manning Perry and Burwell Deas Manning of Columbia. He attended Episcopal High School and the University of Virginia and served in the United States Marine Corps during World War II. Upon his return from military service, he began his career in real estate and was the founder of the Manning Company. He was instrumental in the development of Lake Katharine, Dutch Square Mall, WildeWood, and Woodcreek Farms. He also founded Palmetto Utilities, Inc. which was instrumental in the growth of northeast Richland County. He served in the South Carolina House of Representatives in the early 1960s. An avid horseman, Mr. Manning served as President of the Columbia Polo Association and was Chairman of the US Polo Association Handicap Committee and Training Foundation for many years. 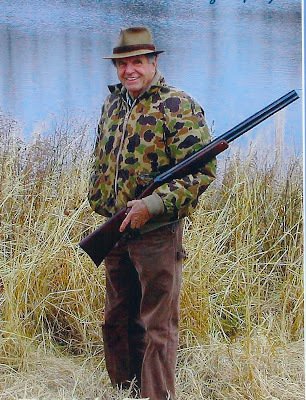 He was the owner of Lugoff Farms where he spent countless hours hunting and watching ducks with his family. Mr. Manning was an active member of numerous clubs and civic organizations in Columbia, Camden and Aiken. He is predeceased by a sister Leila Manning Cart, a brother Burwell Deas Manning, Jr., his wife Mary Elizabeth Holliday Manning, and a son Chappelle Heath Manning, Jr. He is survived by children Jean Elliott Manning, Mary Locke Manning Oliphant (Murray), Dibble R. Manning (Carla), John L. Manning, Joseph William Holliday Manning and Charles Tennant Heath Manning. He is also survived by grandchildren, Chappelle Heath Manning, III; Baker Patterson Manning; Martha Louis Patterson Manning; Mary Hunter Chamberlain; Alexander Pierce Manning; Preston Clarke Manning; and Samuel August Manning. The funeral will be held at Trinity Episcopal Cathedral Tuesday at 2:00 pm. The family will receive visitors at Mr. Manning's home at 128 Holliday Road afterwards. In lieu of flowers, the family requests that memorials be made to Palmetto Health and Hospice or the Trinity Episcopal Cathedral Foundation. This is a sample of some of the music we played last weekend down at Mcclellenville. If this link won't play, then click on the title. Pops took some falls last night. Emotionally draining time, for sure. He's not hurt but he is much weaker and simple won't adjust. So. . . our protocol will have to shift. No more walking to the bathroom. Anyway, I am off to charleston for a breather. I'll be back on Sunday. Rocking chairs, sweet tea, guitars and salty air do a man good. At last, the carp is landed. The weight was simply shocking. Every bit of seventy pounds. Frankly, it was hard to hold up with two arms. It's girth was gi-normous. Will shot it with a bow and and arrow, the arrow trailing a line to a reel mounted on the bow. We've been working on this carp for a couple weeks now.